Recommendation: If you decide to change this setting, do it before affiliates are added. CAUTION: If you change this setting and have distributed affiliate links or permalinks, make sure that these are updated. Unless the incoming affiliate links reflect the current URL parameter name, no affiliate hits, visits or referrals will be recorded. Redirect to destination without Affiliate URL parameter, after a hit on an affiliate link has been detected. Recommendation: We recommend to leave this option disabled as it could cause issues depending on a site’s setup. Affiliate links use an affiliate ID in the URL to identify the affiliate. This ID is either a positive whole number or an encoded version. Affiliates offers to use the ID or the MD5-encoded ID in affiliate links. Either plain or MD5-encoded affiliate IDs can be used. These are appended to URLs to construct affiliate links. CAUTION: If you change this setting and have distributed affiliate links or permalinks, make sure that these are updated. Unless the incoming affiliate links reflect the current encoding, no affiliate hits, visits or referrals will be recorded. CAUTION: Do not assign permissions to open access for affiliates here. This section is only intended to grant administrative access on affiliate management functions to privileged roles. Access Affiliates : Allows users to access the Affiliates menu in WordPress in order to view affiliate statistics and referral data. Administer Affiliates : Allows users to administer affiliates, including to add, edit and remove affiliates. Administer Options : Allows users to make changes in the general configuration. Hits from affiliate links that have originated from robots listed here will not be taken into account nor recorded. By default, the field has no entries but we certainly recommend to exclude especially unorthodox robots who might produce vast amounts of undesired and useless hits on affiliate links. … and follow the instructions to remove these undesired hits. 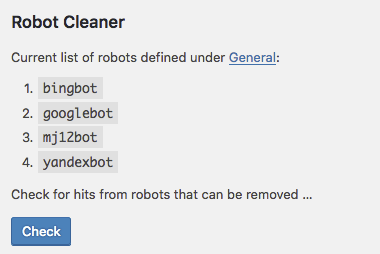 The Robot Cleaner will check existing entries based on the robots you have indicated. When you click Check it will present you with a summary of hits that were detected from those robots and it will allow you to eliminate them definitely. A convenient option is provided to delete all data that has been stored by the affiliates plugin. This option is useful if you just need to start clean while you run tests. Do not use this procedure if you want to preserve your affiliate data. If you have been testing the Affiliates plugin(s) and would like to start from scratch you can use this option to clear all affiliate data. Go to Affiliates > Settings > General and under Deactivation and data persistence tick the Delete all plugin data on deactivation checkbox. Proceed to Plugins > Installed Plugins and click Deactivate for your Affiliates plugin. All affiliate data has been deleted. Now reactivate your plugin by clicking Activate. After this you will start with a clean installation of the affiliates system. CAUTION: If this option is active while the plugin is deactivated, ALL affiliate and referral data will be DELETED. If you want to retrieve data about your affiliates and their referrals and are going to deactivate the plugin, make sure to back up your data or do not enable this option. By enabling this option you agree to be solely responsible for any loss of data or any other consequences thereof. 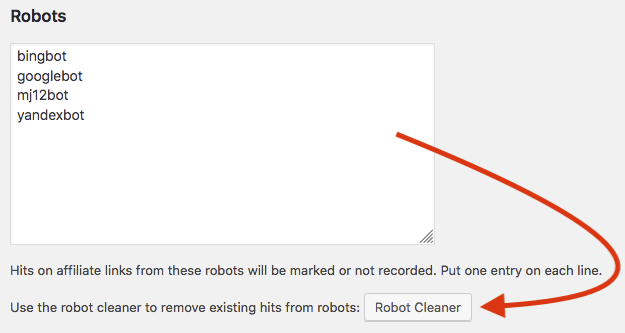 Our recommendation is to always leave this setting disabled unless you definitely are going to use it right now to clean up test data.